Understanding Pennsylvania is our brand new Secondary Pennsylvania Studies program. 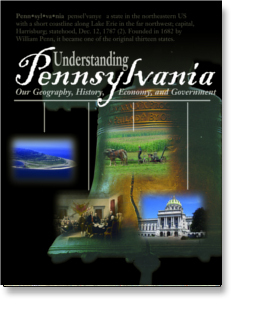 Cost effective and easy to use, our standards-based Softcover text focuses on the Geography, History, Economics, and Government of our state, with a strong ongoing emphasis on Civics,and the Environment. The student text is rich with biographies, primary sources, and cross-curricular connections. Online activities and teacher support extend and enrich this new resource.